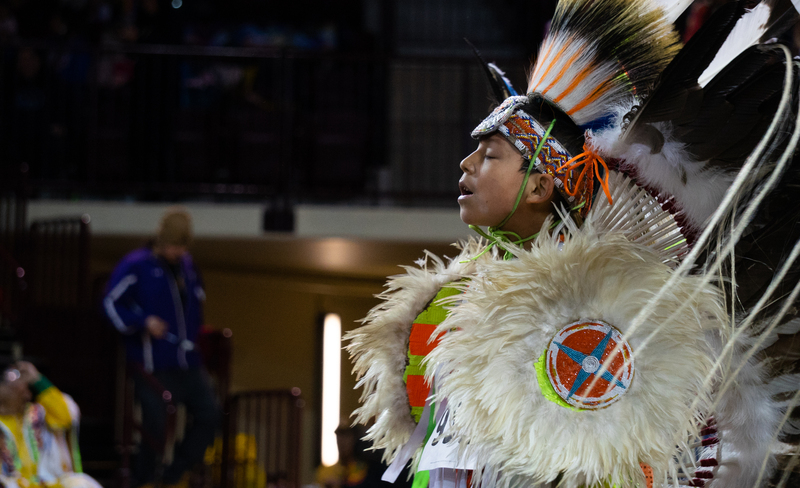 Recap: 30th Annual "Celebrating Life" Pow Wow | Grand Central Magazine | Your Campus. Your Story. Story and photos by Rickey Portis. 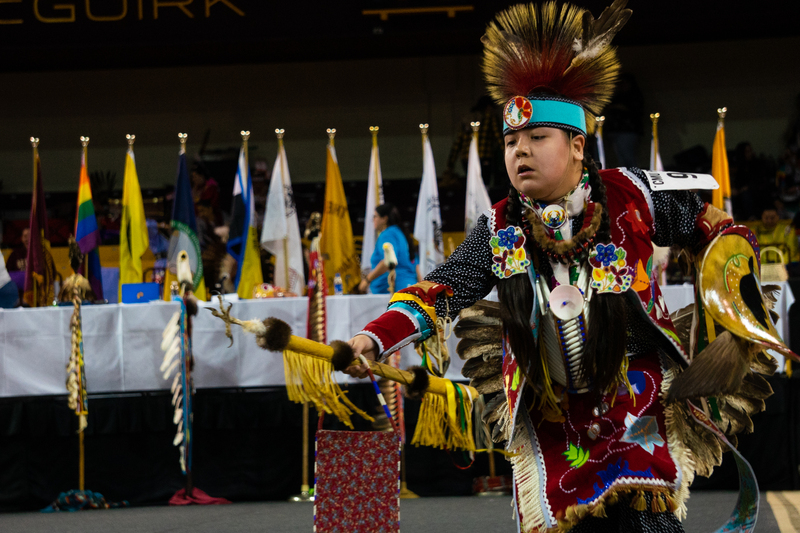 Central Michigan University has been the location of the “Celebrating Life” Pow Wow for 30 years. 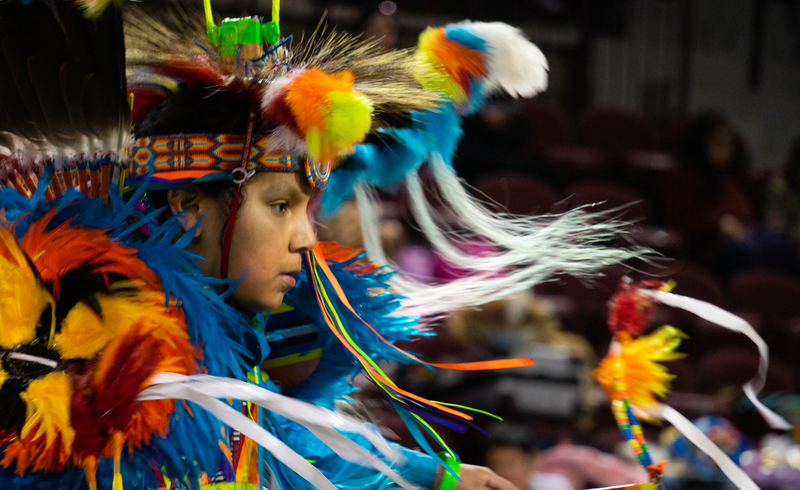 The Pow Wow, hosted by the Saginaw Chippewa Indian Tribe, is a weekend-long gathering of several different Native American tribes. The tribes come together to partake in dance, competition and their shared culture. 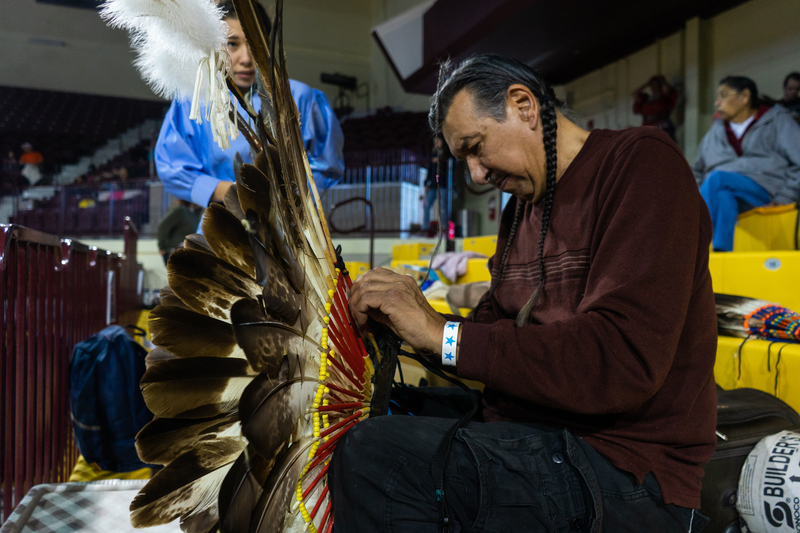 Roger Samaniego preparing Regalia in before the Pow wow start at McGuirk Arena on the campus of Central Michigan University on March, 23, 2019. 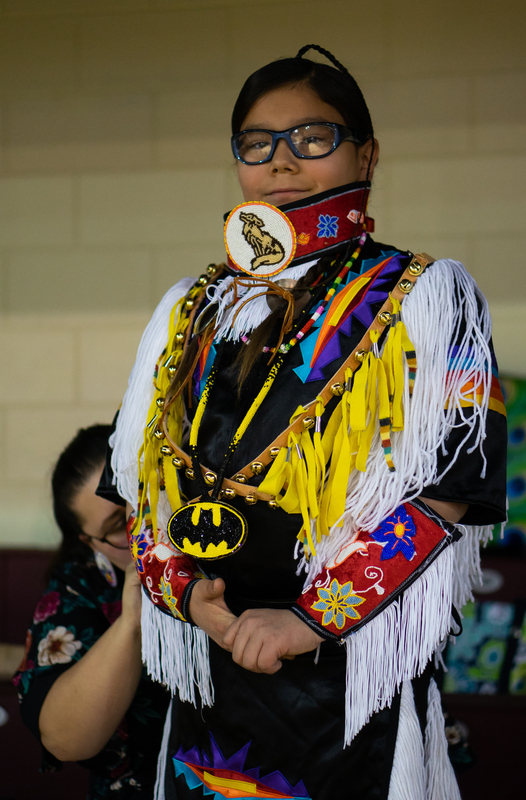 Stormie Frees helps prepare Levi Wakemup’s Regalia before Pow wow at McGuirk Arena on the campus of Central Michigan University on March, 23, 2019. 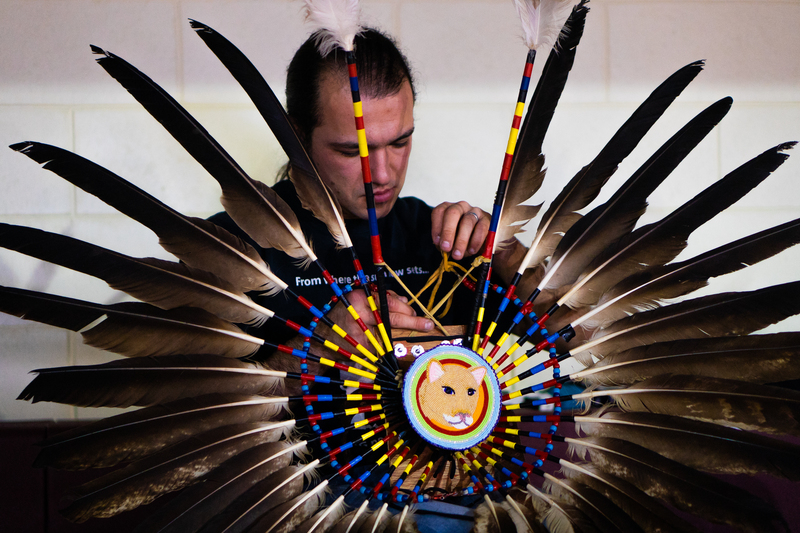 Mike Dashner from Walpole Island, Ontario, Canada prepares the back feathers of his Regalia in the stands before the show at McGuirk Arena on the campus of Central Michigan University on March, 23, 2019. 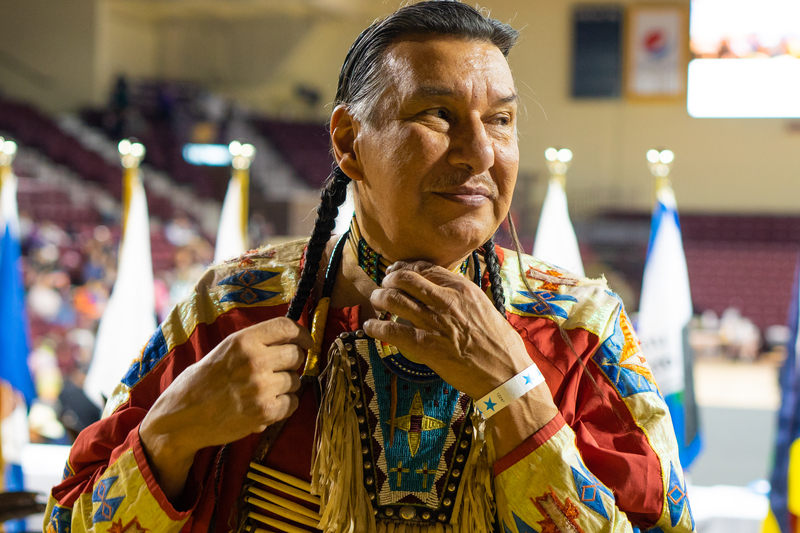 Mike Dashner similes as he finishes preparing for the Pow wow at McGuirk Arena on the campus of Central Michigan University on March, 23, 2019. Wiingashk Shawanna performs in the Jr. Boys Fancy dance at McGuirk Arena on the campus of Central Michigan University on March, 23, 2019. Muh-Juhtheen Roberts performing in the Teen Boys Masked dance at McGuirk Arena on the campus of Central Michigan University on March, 23, 2019. 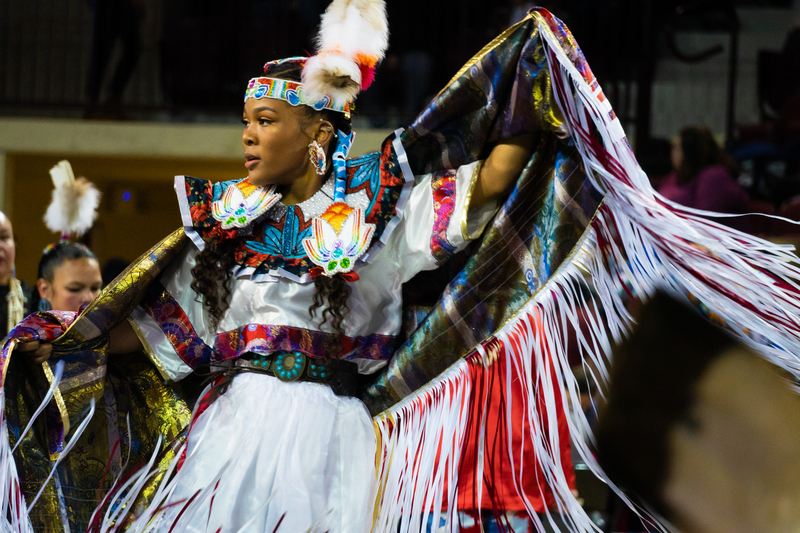 Monique Jones performing in the intertribal dance at McGuirk Arena on the campus of Central Michigan University on March, 23, 2019. 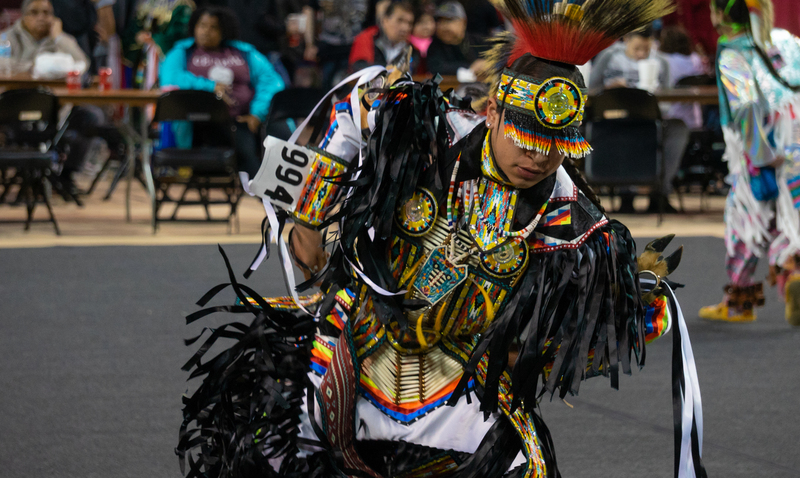 Gegek Webkamigod, a Mount Pleasant Native performing in the Jr Boys Traditional dance, at McGuirk Arena on the campus of Central Michigan University on March, 23, 2019. 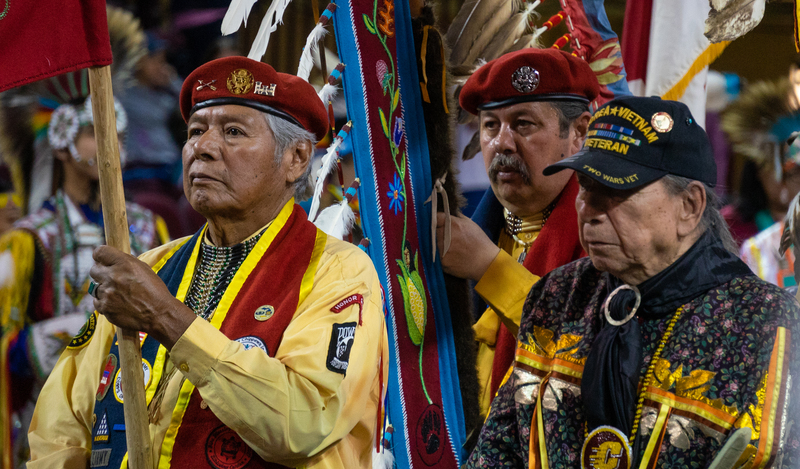 Willard Bigioe (left), Lary Verga (center), and George Mergine (right) carry their tribe’s flags during the Grand Entry as they are honored for their service to the United States military at McGuirk Arena on the campus of Central Michigan University on March, 23, 2019. Lucas Cleavland performs in the Jr. Boys Fancy dance at McGuirk Arena on the campus of Central Michigan University on March, 23, 2019. Separator image Posted in Student Lifestyle and tagged with celebration, Native American, Pow Wow, Rickey Portis.